I would like to take this opportunity, just before New Year’s, to announce my first new partnership for next season. 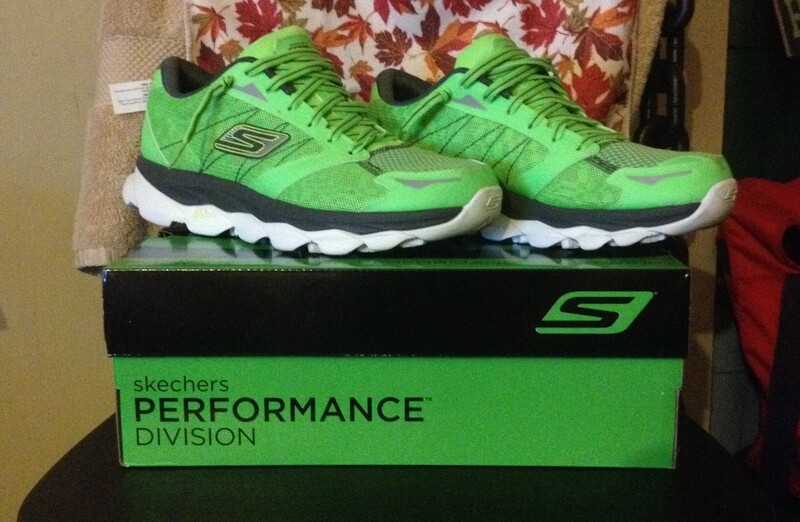 I am excited to be joining the Skechers Performance Elite Team in 2015. This has been in the works for several months, but I can now finally say that I am excited to be joining teammate Mikael Staer Nathan on the Elite Team, and the Ignition Fitness squad as a whole in Skechers running shoes next year. I am excited to be working with this innovative company, and I look forward to repaying the faith with results in 2015. I have also proudly added the Skechers logo to my Sponsor logo sidebar, and to my Sponsors page. Check it out! The journey started with a conversation with sales rep Nick Resch at the Toronto Triathlon Festival. Shortly after, I got my hands on a couple pairs of GORun shoes (the GOMeb Speed 2’s and some Nite Owl GORun Ultra’s), and immediately fell in love. Through every phase of the process, I was impressed with how engaged and invested everyone I talked to was with making the jump of Skechers into the performance footwear market a success. 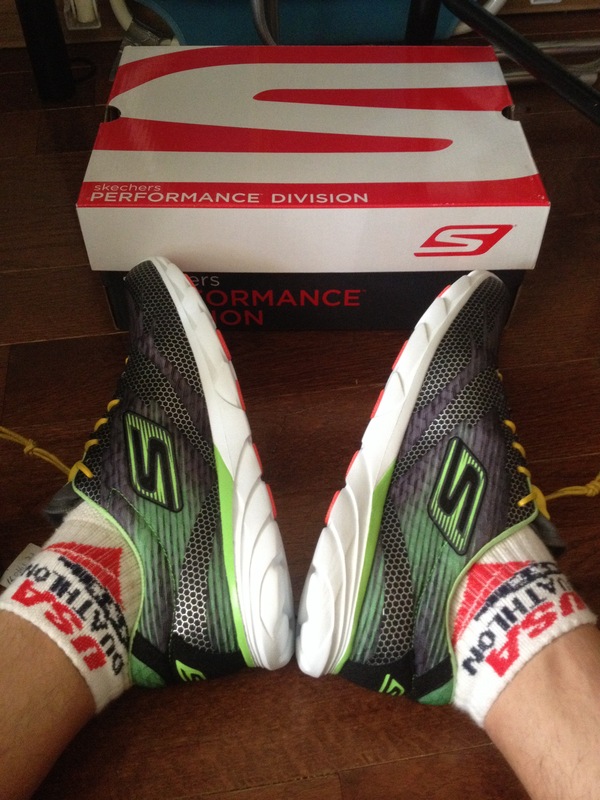 Indeed, Skechers Performance is for real. I raced in the flats at Lakeside, and have been using the Ultra’s for the bulk of my mileage since the season ended; so far I have enjoyed both. The GOMeb’s were the closest feel I have ever had to my beloved Type A5 flats, and I actually prefer the natural last of the Meb’s to the more traditional build of the A5’s. It promotes a much more natural midfoot strike that lends itself excellently to short course speed. The complaint I have always had about the Saucony flat was the traditional feel of it; at times, I felt like it was guiding my foot in a way that was not natural, rather than letting it do what it wants. So far, I have not noticed the same thing with the Meb’s. I’ve also really enjoyed my mileage in the Ultra’s. They are much wider in the toe box than I am used to, but I have been pleasantly surprised by the feel. I had the same complaints about my Mirage’s and Ride’s as I did with the Type A5’s: when I got tired, I found that they “guided” my feet in an unnatural motion more than I wanted. I haven’t found this with the Ultra’s yet, though admittedly I have not done a 75-90 minute long run in them. I do really like the feel of the last, and they are light enough that I wouldn’t hesitate to wear them for a long progression or tempo run that dips down below 4:00/km. As an added bonus, the lugs on the tread have been great in tricky terrain! I am really looking forward to getting into the 2015 line of GORun Performance footwear. The new GORun 4 is completely redesigned, and has been favourably compared to the incredibly popular Kinvara 5. I’m also excited about the update to the GOMeb’s…some combination of these will likely make up my race footwear next year. Hopefully I can get into some of the GOBionic Trail shoes as well…I always shy away from trail running after a bad experience slipping on some mud in ill-equipped shoes, but I love to get muddy once in awhile. 2015 should be a great year, and I’ll be doing my running in Skechers for all of it. Go like never before, and have a fast day! The Triathlon Canada championship schedule was announced well in advance (January), but did not include a duathlon national championship. That particular announcement did not come until March (or May for the sprint race)…likely because there were simply no locations bidding to host the championships. Yes, it was a debacle, but the result was slow registration and a poorly attended national championship. To add icing to the cake, the organizing committee chose not to renew the duathlon for 2015 (as was the case in 2012/2013 at TTF). The second scenario was the release of the Triathlon Ontario championship schedule. Again, announced well in advance (January) and this time INCLUDED a duathlon championship at Lakeside. True, the original date was changed from mid-August to mid-September for reasons beyond our control. However, we were given options by the hosts, and Lakeside remained. We pushed the race hard on Duathlon Central and on social media for months, and even managed to convince MultiSport Canada to let us do live coverage for the event. This was essentially the ideal situation for duathletes with regards to provincial championship exposure. And the result was…slow registration and a poorly attended provincial championship. 1. Keep doing what we are doing. Minimize risk, sign up a week or two in advance and hit the races that are closeby. With the uncertainty involved for big events, it is definitely hard to rationalize several rearrangements to your schedule as the announcements trickle in. And trying to guess the dates is about as sure of a thing as Russian Roulette! Alas, if we continue on the same path, the catch 22 continues. Race directors often already have their minds made up before raceday registration. Signing up the day of often doesn’t do more than salvaging the event for one more season. Getting more races or amenities? We can probably forget it. Stagnant growth may be better than decline…but not by much. The vicious circle will continue. 2. Take charge. Registration is open, or opening very soon, for most of the races on the schedule. Pre-registration shows commitment and leaves an excellent impression in the minds of race directors. A good pre-registration, or several in a row, can save a race indefinitely. A strong pre-registration takes the guesswork out of an RD’s job, as bib numbers can be ordered, and t-shirt, award and food orders can be firmed up to reduce waste. This puts their mind at ease when it comes to big and potentially expensive decisions…like putting in a championship bid. 3. Head to some new locations that offer what you want if you have to. I understand this is not always possible for those with families and commitments but regardless, a championship loses relevance if a race organization is laying out the resources to cover the costs of a championship, only for a mainly local field to show up. If race directors see athletes willing to travel to races to get what they want, they may be more willing to put in that bid…knowing that they will see a truly national or provincial field as part of the return on their investment. Fair or not, if we’re not willing to go out of market for championship races, then we risk losing them for good. 4. SPREAD THE WORD. Do you have friends who are runners but are looking for a new challenge? Why not turn them on to duathlon? I have never understood why duathlon isn’t more popular relative to triathlon, despite having only two sports to train and eliminating the most logistically challenging! If every duathlete brings a friend who wants a new challenge, or one who is intrigued by triathlon but just doesn’t have the time to spare to get to the pool, then we double the numbers of every race. New blood is just another way of showing RD’s that we are committed to making our sport sustainable! And triathletes…why not try out a duathlon once or twice next year? A full schedule can be found here. Such a fuss is made about races where you have to get wet, but what about one where you do not? No fiddling with wetsuits, goggles, water temperatures, sand and frenetic swim starts. Just a simple RUN-BIKE-RUN, and the need to truck half the amount of stuff to a race that you normally do. Sure, the first run makes the rest of the race tough…but in a sport where the pinnacle is Ironman, isn’t challenge what we are all looking for? Duathlons can make great rust busters before that first tri, fun season finales once the water cools off too much, and an excellent change of pace in the middle of a long season. Come join us once in awhile, we don’t bite! 5. OR…we can all learn to swim. Just kidding. Sort of. As much as we would like to be held on the same level as triathlon, the reality is that triathletes get the things that duathletes want because they have the numbers to back it up. The risk of hosting a championship that exists with duathlon does not with triathlon, because hosts of triathletes will travel to Magog, Edmonton or Toronto to race a championship event. They know the race will sell out, or close to it, which eliminates a lot of the risk of not getting a return on their investment. It may take time, but change takes time. The options above are just the first steps. The powers that be and the organizations that care are willing to work with us.There have been rumblings and discussions among the big names in the sport (*cough* notably absent was Trisport Canada *cough*) to discuss the state of duathlon in Ontario. Duathlon is a sport that is steeped in multisport history, and they want to get there again, just as much as we want to. We need to convince the race organizations that we are willing to do what it takes to generate a return on their investment…that the next big star in multisport might just be a duathlete…that the next can’t-miss race on the calendar could be a duathlon. We are very spoiled to have race organizations like Multisport Canada who do so much for such a small community. Not many race organizations would stick to their guns and continue to put on events that draw 40 people, but they do. I’m not sure about you, but I think it is about time that we return the favour and step out of the large shadow cast by triathlon. Help resurrect this great sport.